Robotic-assisted bariatric surgery is part of the armamentarium in many bariatric centers. However, limited data correlate the robotic benefits to with clinical outcomes. This study compares 30-day outcomes between robotic-assisted and laparoscopic procedures for Roux-en-Y gastric bypass (RYGB) and sleeve gastrectomy (SG). Using the 2015–2016 Metabolic and Bariatric Surgery Accreditation and Quality Improvement Program (MBSAQIP) database, patients between18- and 65-year-old were included. To adjust for potential confounders, 1:1 propensity-score matching (PSM) was performed using 22 preoperative characteristics. Second PSM analysis was performed adding operative time and conversion rate. 269,923 patients underwent SG (n = 190,494) or RYGB (n = 79,429). 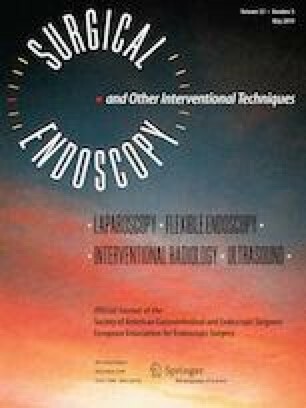 The operative time was significantly longer in the Robotic-assisted compared to laparoscopic approach either for SG (102.58 ± 46 vs. 73.38 ± 36; P < 0.001) or for RYGB (158.29 ± 65 vs. 120.17 ± 56; P < 0.001). In the SG cohort (12,877 matched cases), the robotic approach showed significant reduction of postoperative bleeding (0.16% vs. 0.43%; P < 0.001) and strictures (0.19% vs. 0.33%; P = 0.04) with similar results in the other 30-day outcomes in both analyses. Similarly, for the RYGB cohort (5780 matched cases), the robotic approach showed significantly fewer requirements for blood transfusions (0.64% vs. 1.16%; P = 0.004) with no statistically different results for the other’s outcomes. Conversely, when adding operative time and conversion rate to the PSM analysis, the robotic platform showed significantly shorter length of stay (2.12 ± 1.9 vs. 2.30 ± 3.1 days; P < 0.001), reduction of anastomotic leak (0.52% vs. 0.92%; P = 0.01), renal complications (0.16% vs. 0.38%; P = 0.004), and venous thromboembolism (0.24% vs. 0.52%; P = 0.02). Our findings show that postoperative bleeding and blood transfusion are significantly reduced with the robotic platform, and after correcting for all factors including operative time, the robotic-assisted approach is associated with better postoperative outcomes especially for RYGB. Raul Sebastian, Melanie H. Howell, Kai-Hua Chang, Gina Adrales, Thomas Magnuson, Michael Schweitzer and Hien Nguyen have no conflicts of interest or financial ties to disclose.